Do you skip breakfast? Maybe more importantly, do your kids? I haven’t always been a breakfast person, but I have grown to think of breakfast as the most important part of my day and I ALWAYS make sure my kids eat breakfast. Is it always a good breakfast? Well, no. Sometimes it’s just a granola bar on the way to an early morning appointment. But even a bad breakfast is better than no breakfast when it comes to low blood sugar induced temper tantrums. Enter Seneca Farms. 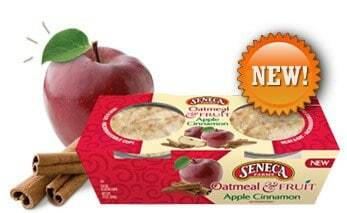 Seneca Farms has just introduced their new Oatmeal and Fruit Cups which make a breakfast easy AND nutritious. Not only is it easier to make than instant oatmeal packets (just open and microwave), but it has thick-cut oats, not the paper-like instant oatmeal flakes. It currently comes in 2 flavors – Apple Cinnamon and Vanilla Peach – but they hope to roll out Cranberry Apple and Maple & Brown Sugar, as well. I was sent a package of both the Vanilla Peach and the Apple Cinnamon flavors to try. My whole family tried them out and thought they were pretty good. In fact, the next morning my 3 year old asked for the apple yogurt. Since she’s used to oatmeal from a cup she figured that if it was in a container it must be yogurt. The texture was soft but substantial…much more like when I make Old-Fashioned Oats at home than oatmeal packets. Seneca Farms Oatmeal & Fruit Cups almost had a feel that they had pie filling in them, probably due to the fact that they contain fruit juice as part of the liquid in them. We don’t normally have a lot of convenience food on hand since I prefer to cook from scratch but this is one of those convenience foods that would not make me feel like I was compromising. The ingredients were all normal things I could have around my kitchen (I don’t, but I know others who do) and they were super yummy. This would definitely be on my travel list as a breakfast in the room option or even on the road. All you need is a microwave and most hotels have those in the lobby and many gas stations have them as well. And if you have kids, the containers are sturdy and would make great pots for mixing paints or rinsing out paintbrushes or other art projects. I might go get more specifically for that reason. 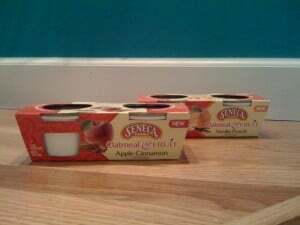 Seneca Farms Oatmeal & Fruit Cups are sold at Walmart & other grocery stores. To find a store near you, visit Seneca Farms on the web. My grandgirls both like fruit and cereal for breakfast. They also like pancakes!